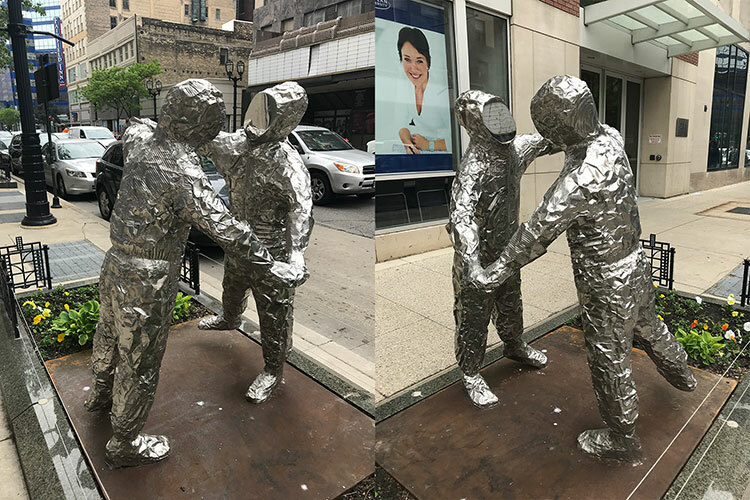 MKE Music Rewind: Temper Temper, "Trust Me"
Take a stroll down Wisconsin Avenue this summer and you’ll see something familiar, yet different. 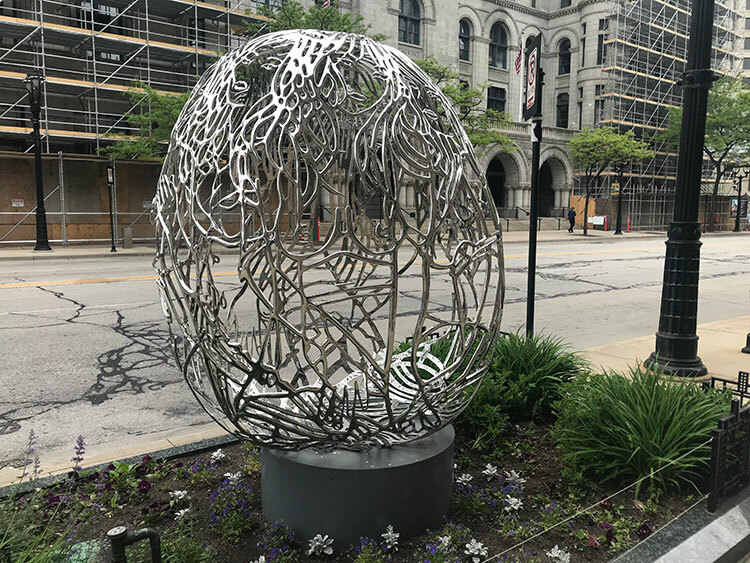 Yes, it’s Sculpture Milwaukee, the “outdoor art gallery” that first populated downtown with world-class sculptures in 2017. 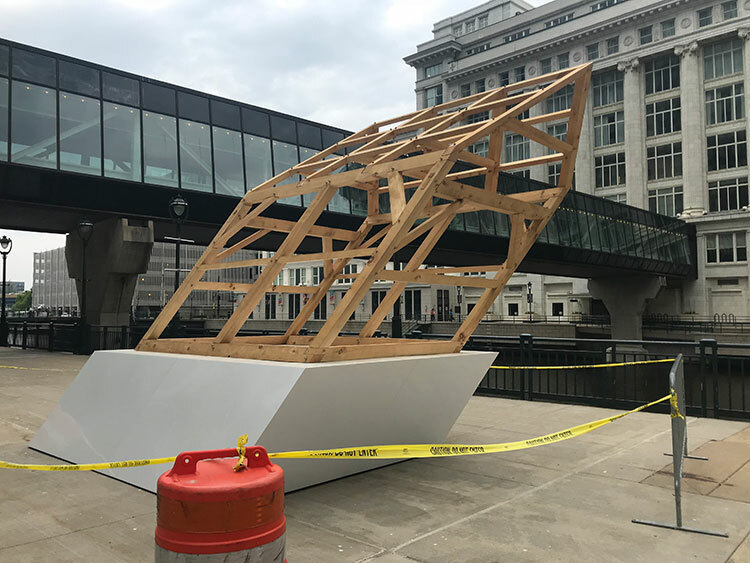 Funded by Steve Marcus and curated by Russell Bowman, this year’s “urban exhibition” features 21 pieces (three of them holdovers from last year) by 22 artists. Once again, Wisconsin Avenue has never looked so good. This one’s currently on hold, but it’s apparently (and literally) a shadow of Michelangelo’s David, which sounds funny and great. 20. 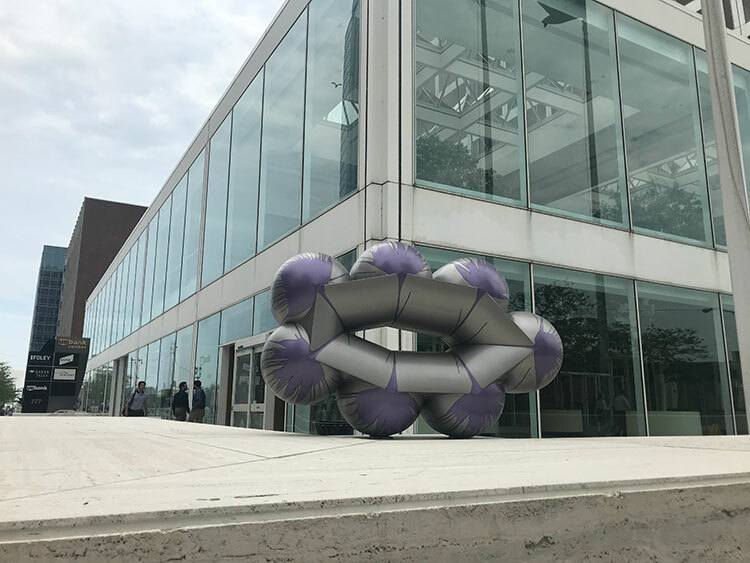 Richard Deacon, Big Time, 777 E. Wisconsin Ave.
We’re all for art that garners a physical response, but this one just makes us feel…gross? Big Time is a triple-threat of ickiness: the eye-like opening, the bulbous growths, the colors. At best, it looks like a pretty cool inflatable raft sitting on its side. 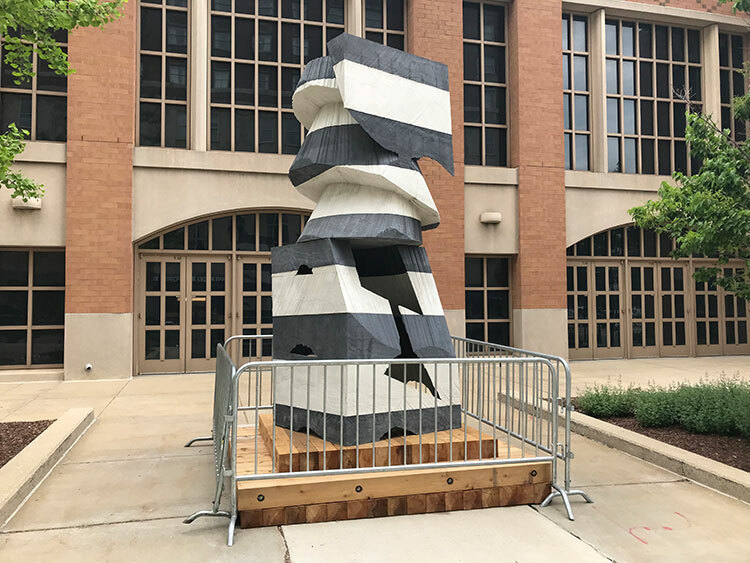 A holdover from Sculpture Milwaukee’s 2017 season, Zach’s Tower is a three-dimensional representation of all the canted angles and towering insanity found in your average post-industrial city. Also: remember when they tried to put that lame #Spot4MKE thing here? 18. 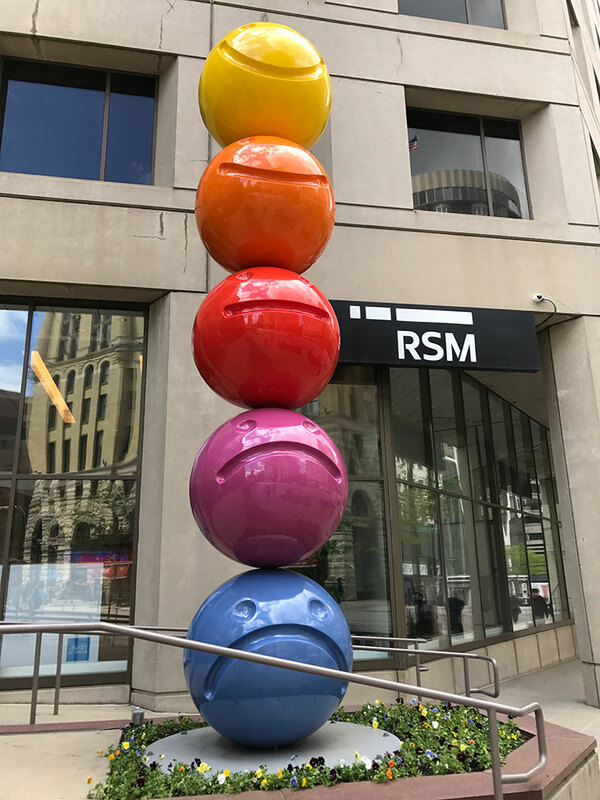 Tony Tasset, Mood Sculpture, 411 E. Wisconsin Ave.
Another holdover from 2017, dropping a few spots because, well, thems the breaks. One person’s pile of emojis is another person’s string of, ahem, beads. 17. 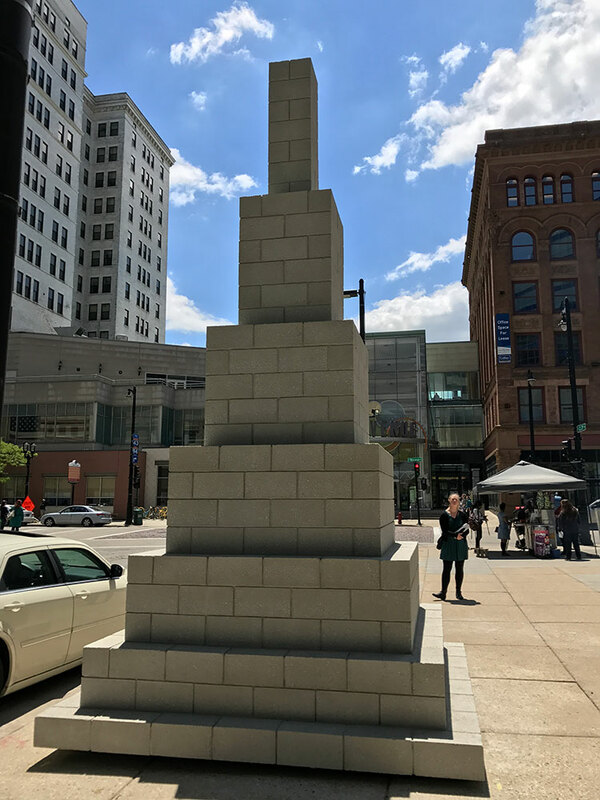 Sol LeWitt, Tower (Gubbio), 310 W. Wisconsin Ave. The final holdover from 2017. The more you look at it the funnier it gets. It’s either a comment on the prefab nature of modern architecture or an ode to Super Mario Bros.
16. Ghada Amer, Blue Bra Girls, 526 E. Wisconsin Ave. There are faces and body parts buried in there somewhere. Blue Bra Girls is like a Fabergé egg without the egg. Also, it blends in with all the scaffolding. Bold ice cream-like banding, crazy angles, kooky cut-outs, and a puzzle-like vibe only a Rubik’s Cube nut could love. 14. Bosco Sodi, Untitled, 111 E. Wisconsin Ave. 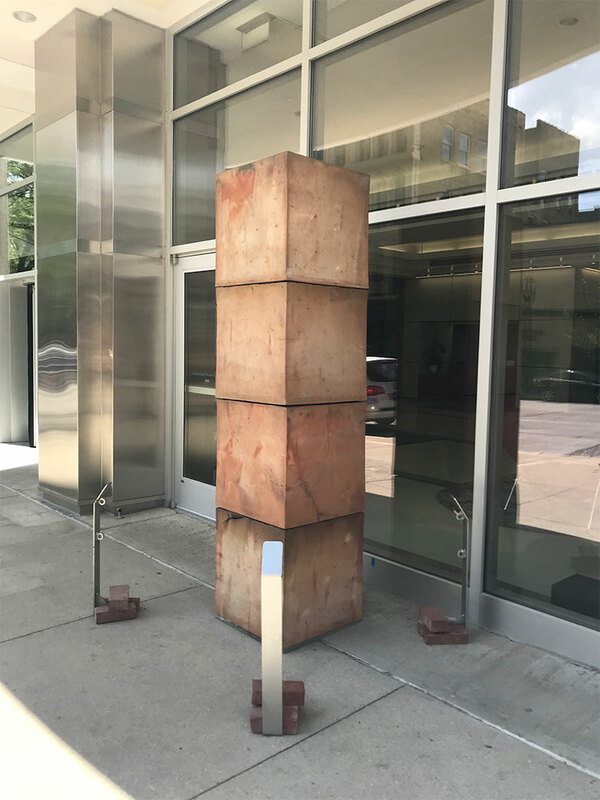 Feeling the need to ponder a stack of four clay cubes in the middle of downtown? You’re in luck. 13. 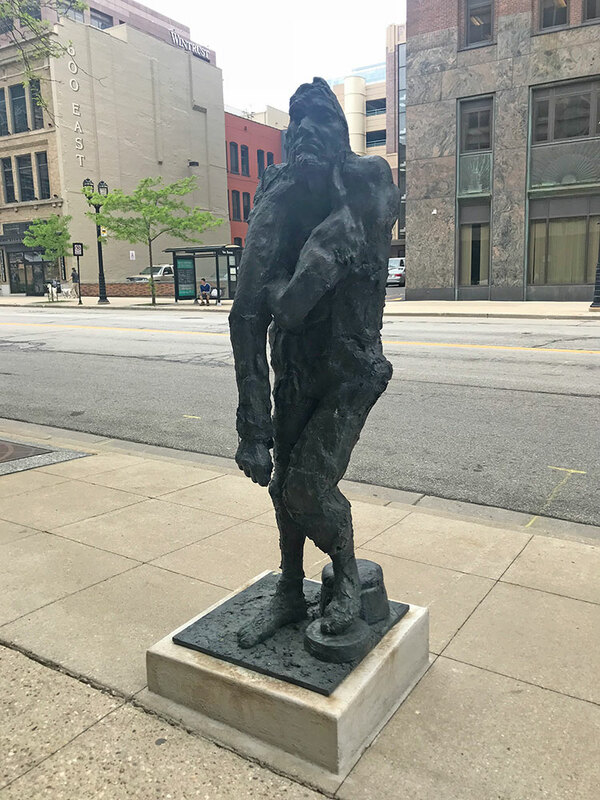 Liz Glynn, Untitled (Burgher with extended arm), 611 E. Wisconsin Ave.
A remake/remix of one (or is it two?) figures from Auguste Rodin’s The Burghers of Calais. What does it say about art? About repurposing art? About lumpy masses of humans slouching their way down Wisconsin Avenue? 12. Shana McCaw and Brent Budsberg, Skew, 111 E. Wisconsin Ave. 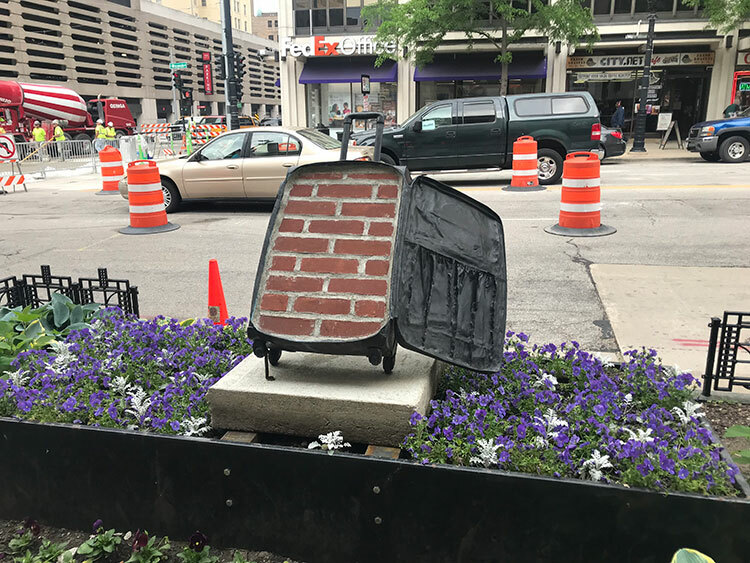 Speaking of slouching down Wisconsin Avenue, depending on which direction you’re slouching, Skew either leans precariously to one side or miraculously rights itself. It’s a pretty nifty optical illusion, even if the piece looks (intentionally?) incomplete. 11. Jessica Jackson Hutchins, Reason To Be, 929 E. Wisconsin Ave. Anyone who has experienced the inhospitality of Bay View’s infamous Art Stop knows that sometimes a bus shelter should just be a bus shelter. 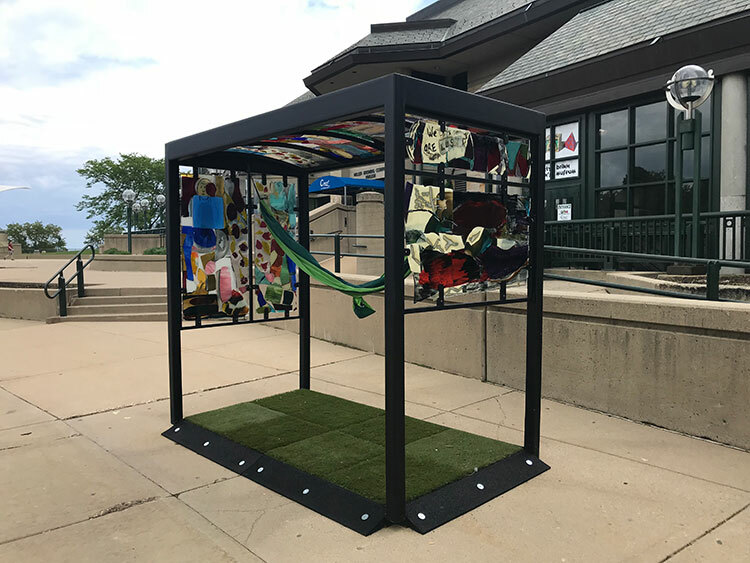 Reason To Be riffs on this by taking an actual decommissioned bus shelter and adorning it with stained glass, astroturf, and a hammock. 10. 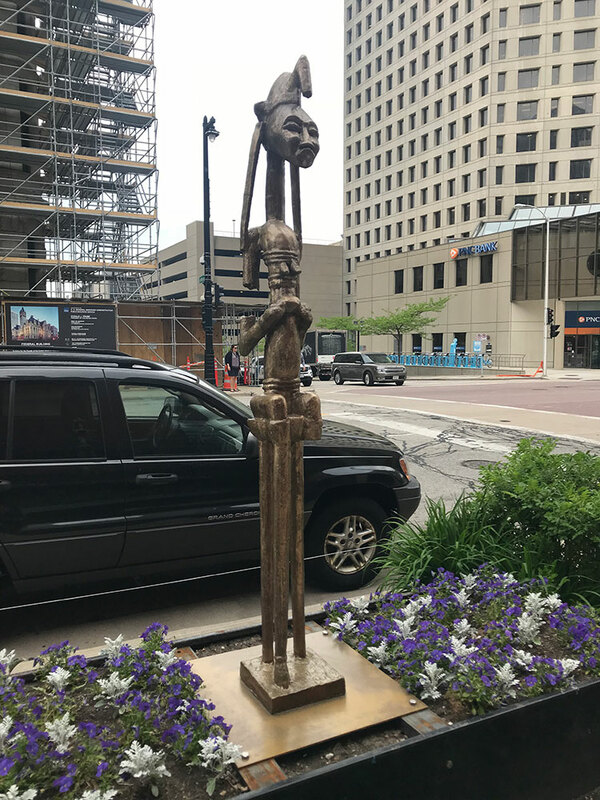 Sanford Biggers, BAM (Seated Warrior), 500 E. Wisconsin Ave.
A small African “power” figure writ large. Striking, immovable, really tall. 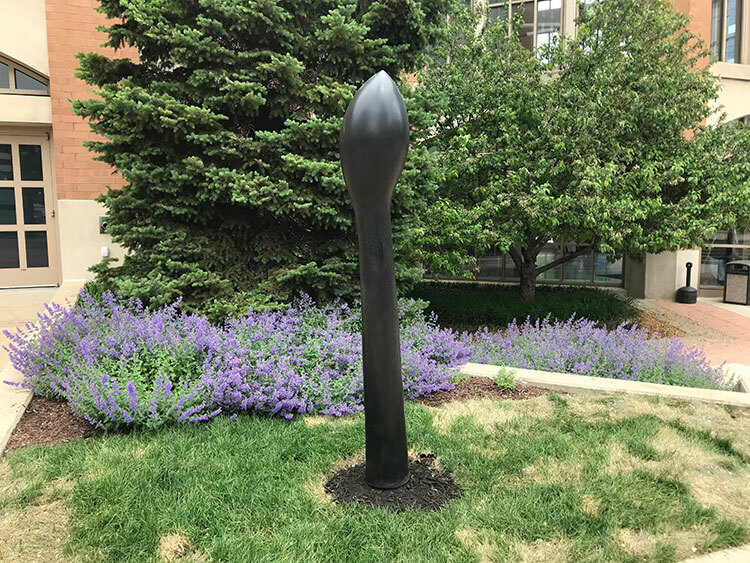 Yep, it’s a flower bud (crossed with 2001‘s monolith, sort of) and it’s beautiful and great. 8. Tom Friedman, Hazmat Love, 211 W. Wisconsin Ave.
GAZE UPON THE FUTURE (and one another) AND DESPAIR. 7. 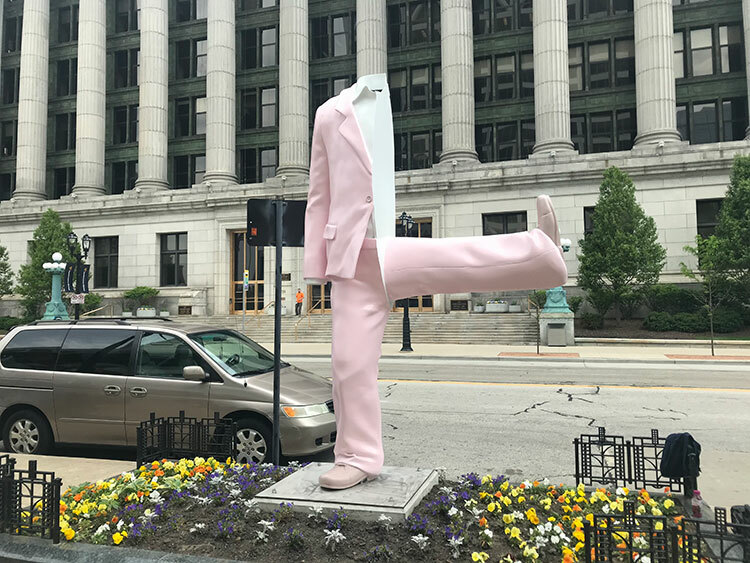 Erwin Wurm, Half Big Suit, 777 E. Wisconsin Ave. Downtown working stiffs can now enjoy this playful reminder of the absurdity of their working-stiff life. One part David Byrne, one part Ministry of Silly Walks. 6. 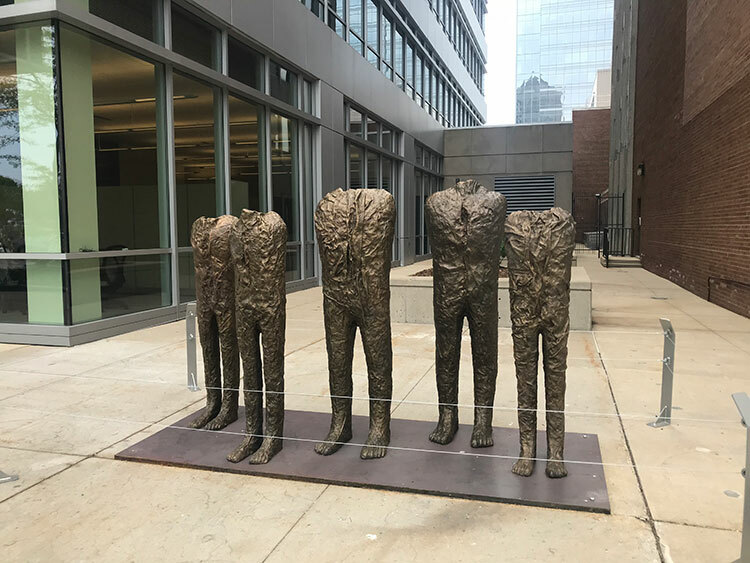 Magdalena Abakanowicz, The Group of Five, 875 E. Wisconsin Ave.
More suits. Sort of. Remember the ending of Annihilation, where Natalie Portman is fighting whatever the hell she’s fighting? That thing kind of looks like these things. 5. Hank Willis Thomas, Liberty, 176 W. Wisconsin Ave.
A riff on the Statue of Liberty, of course. Fun fact: The arm was based on a 1986 photo of Juwan Howard! 4. 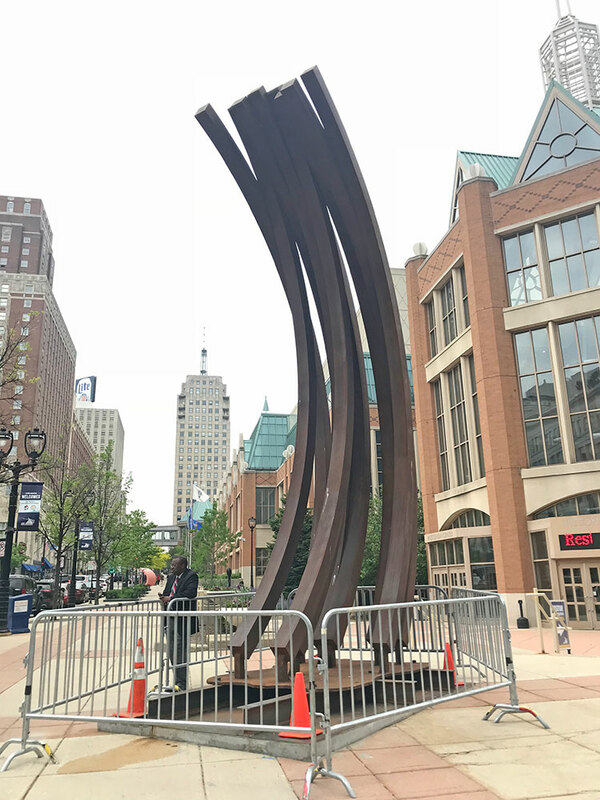 Bernar Venet, 97.5° Arc x 9, 4th Street and Wisconsin Ave. 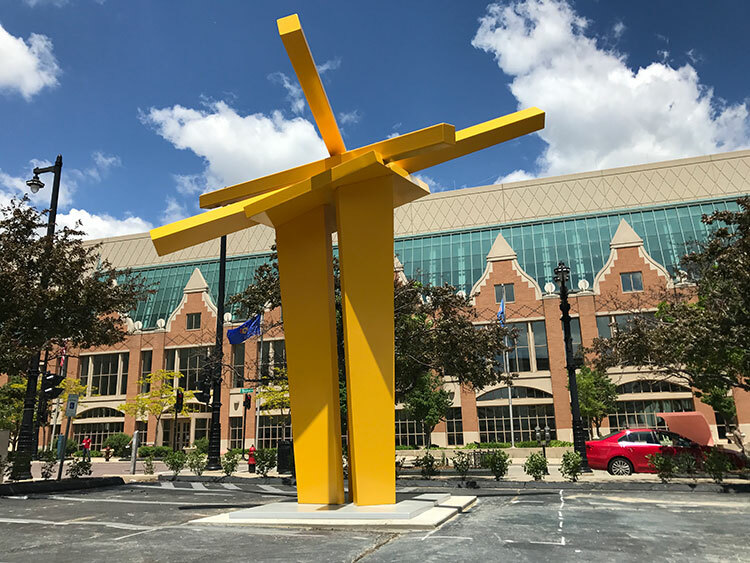 There aren’t many “big” sculptures this year (see 2017’s Mixed Feelings, now on permanent display outside City Hall), but this one is plenty big. The title says it all: nine lines at 97.5-degree arc bend. 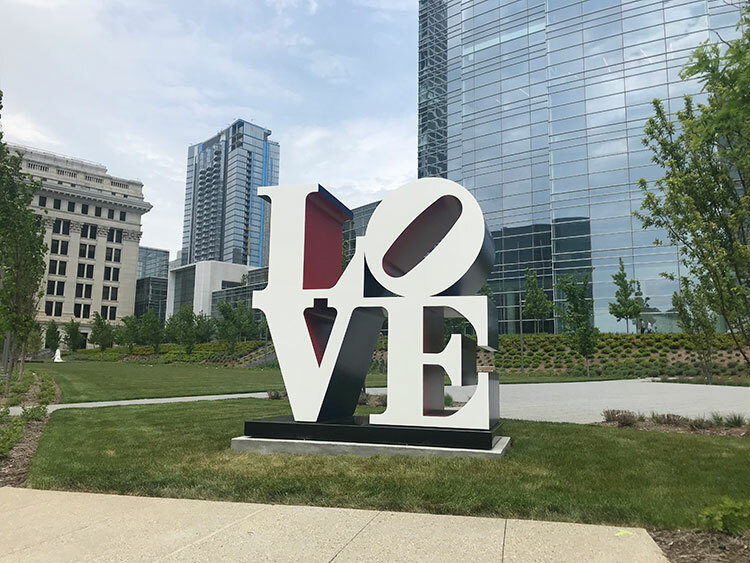 If we were doing a list of Sculpture Milwaukee sculptures that will inevitably be the most—god help us for typing this next word—”grammable,” then Robert Indiana’s iconic LOVE would be on top. And why not? 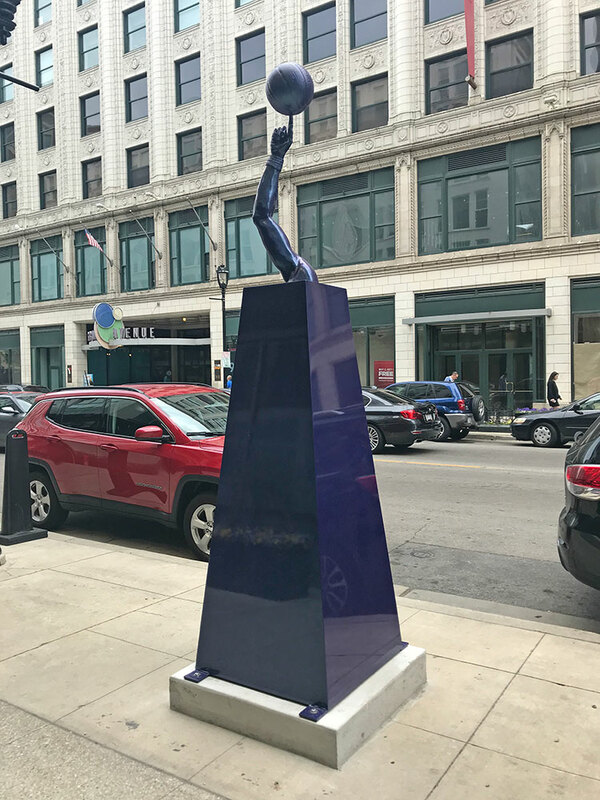 LOVE is a familiar, striking sight, and one that looks pretty sharp in front of the new Northwestern Mutual tower. Another win for Northwestern Mutual. 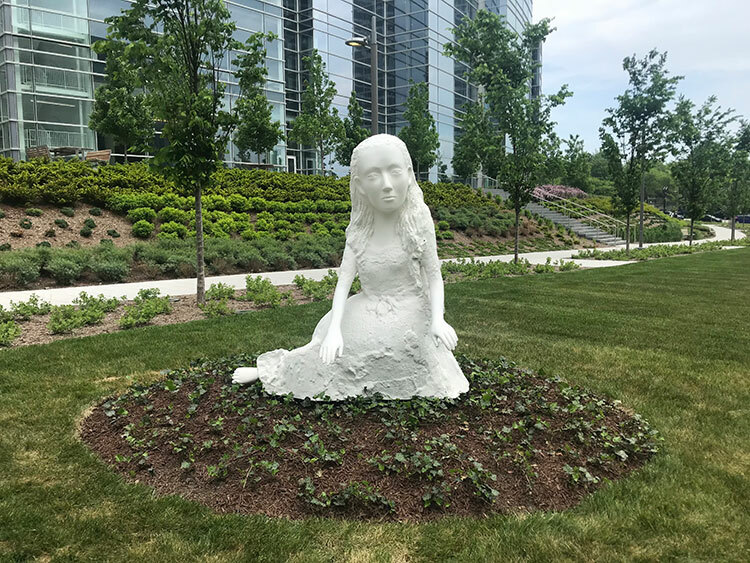 A hauntingly oversized Alice sitting in the company’s lush, oversized campus. A Kickstarter to keep this here forever, please. 1. Yoan Capote, Nostalgia, 301 E. Wisconsin Ave.